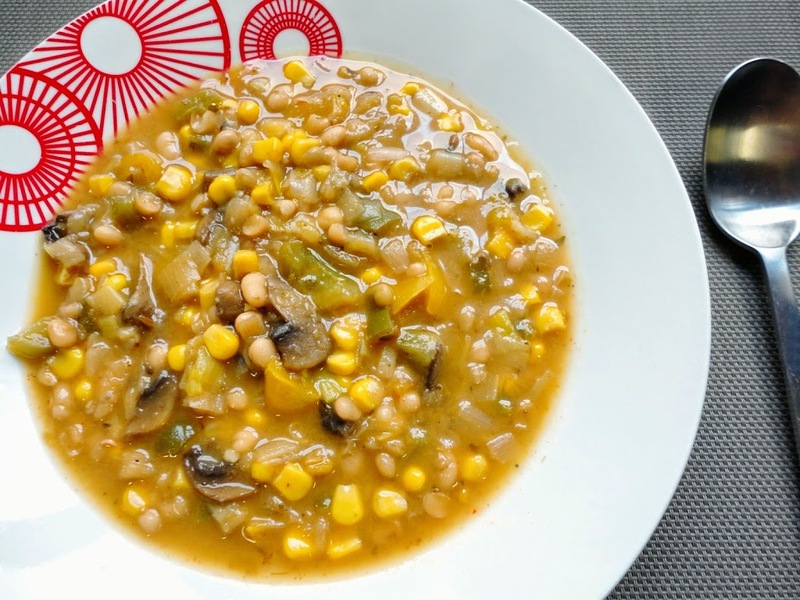 This Healthy Spring Vegetarian White Chiliis warming, hearty, full of lots of nutritious and vibrantvegetables and very fillingfrom the fibrousand protein-packed beans. This is not your average traditional tomato-based winter chili bur rather a lightspring chili which opts instead for a light vegetable and white bean broth base. This Vegan White Chili is also perfectly spiced from the cumin and oregano, spicy from the cayenne pepper (though you can use less if you prefer less of a “kick”), and also slightly sweet from the bright sweet corn. 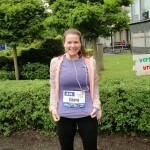 My first 15 km race in Bruges & Getting over ‘Silly’ Goals! I made this for my friend’s birthday. It was a huge hit. I served it with roasted purple brussel sprouts, purple cauliflower, and purple potatoes. I also made sweet potato cornbread to go with it, and it finished the meal perfectly. Thank you so much for sharing this recipe. We made this last night and it was really good! Even my son who doesn’t like peppers, mushrooms, or beans liked it. I doubled the recipe and I’m having leftovers for lunch with a big handful of kale mixed in. Thanks a lot! Thank you SO much for the feedback, Joy!! I am so happy that you are your family enjoyed this Chili! It’s been a while since I’ve made it and think I just might have to make it again soon 🙂 Your addition of kale sounds delish! 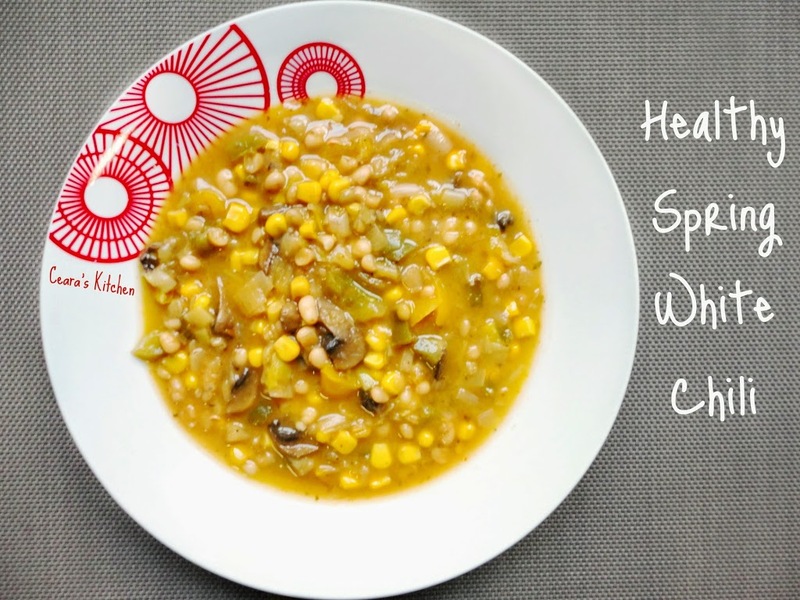 this is a perfect twist for spring, white beans, peppers, corn and bright colors! Thank you so much, Richa! I love bright colors in cooking, especially this time of year when all the beautiful flowers are budding in time for spring! I am actually looking forward to making your “Easy Spiced Peas” for an easy dinner tonight over a bed of cauliflower “rice”! It has been a busy few weeks! I teach college English and both me and my students have been busy! This healthy chili looks perfect. Thank you for sharing! Thanks Savy! Awesomee leftovers (I even kind of prefer the chili the next day!!) Thanks for the pin! Have a great week! I’m a fan of anything ANYTHING with corn in it. This looks delicious! And good luck with the end of your semester! I remember how stressful all those finals and essays were! And have fun at your race! Thanks Chris!! I’ll need all the luck I can get haha! Corn makes brings any dish to the next level, plus nothing beats bbq’d corn on the cob in summertime! Good luck with all your essays! This chili looks amazing. Ha ha, I remember the days in my undergrad degree cramming assignments too! My go to foods have always been coffee and chocolate. I TRY my hardest to make healthier versions though now. I remember the days when all I literally used to have is one iced mocha and a small chocolate bar…and that was it for the day! Glad I stopped that. My go to comfort foods now are usually raw chocolate and an iced mocha, and I also love protein pancakes. Oh and pizza with cauliflower base. 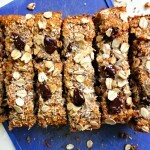 Anyway, this recipe looks DELICIOUS and I am so completely impressed with the protein content! I’ve recently realised that I am not getting enough protein, and have been relying far too heavily on powders. I just gets so bored of smoothies all the time though. This is definitely on my ‘too make’ list this week especially as it’s coming into winter here. Yes to coffee and double yes to chocolate (can’t go a day without a piece of dark chocolate!!). I am glad you stopped that too because protein pancakes and cauliflower pizza sound too good not to pass up! It’s amazing how we can all develop into better eating habits – I can’t get over all the things I’d snack on in my undergraduate degree! I still need to try making a cauliflower pizza crust – it’s been on my “to cook” list forever! Thanks for the sweet words and let me know if you try this chili – it definitively has a high protein kick to it 😀 And you are just starting winter? Are you located in AU or NZ? Too cool!! We just got over winter here and now I’m looking forward to summer 😉 Have a great weekend!! 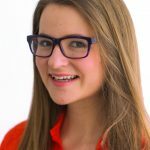 Sounds like you’re in a similar position to me, nearing the end of a year of studies and looking for healthier options to the traditional student food! Yes – we are so in the same position! Can’t wait for my exams to be over and all these papers to be done!! 😀 Thanks for the kind words! Jalapenos would be pure perfection with this (with the seeds in for an extra kick!!!). Good luck with the rest of your schoolwork – before we know it, it will be summertime! A hunk of cornbread sounds like an AMAZING idea and would go perfectly with this 😀 Thanks for the kind words, June!